What an exciting time in your life! 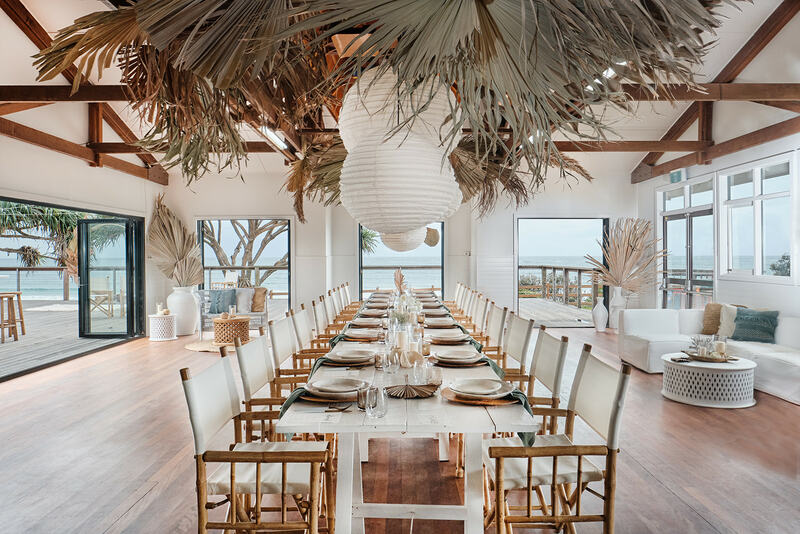 We’d love to hear your beautiful wedding ideas and discuss the options for hosting a magical wedding at The Byron Bay Surf Club. Our team is a collaboration of the region’s most innovative, energetic and creative wedding planners, stylists and caterers. 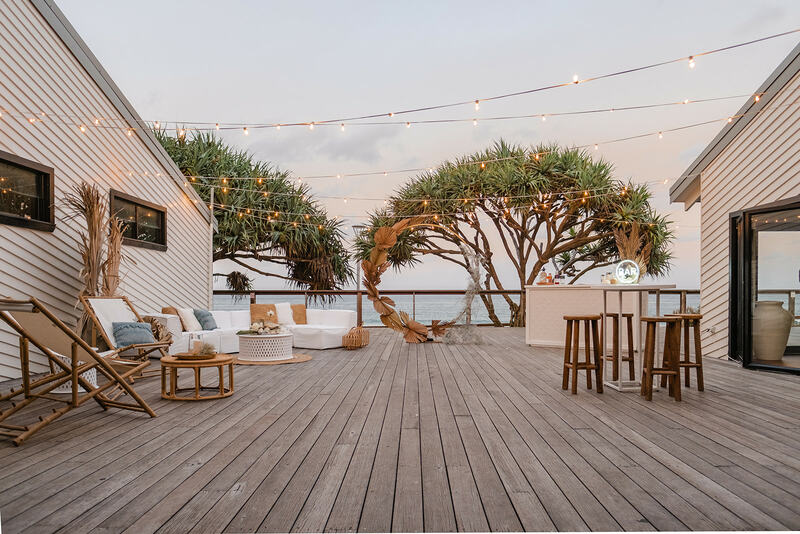 Born in 2006, Byron Bay Weddings was created to help couples plan their dream wedding in Australia’s most sought after wedding destination, Byron Bay. Over the years our team has grown to be the definitive home of all things weddings in the Byron region covering everything you need to enjoy the most magical day. Our team know the venues inside out and have planned and coordinated 100s of weddings and events in the region. With our experience and expertise, we will ensure you make the most out of your time, ideas and budget, so it’s a day you will look back on with the greatest admiration. Creating bespoke wedding experiences that couples will look back on as one of the most incredible days of their lives. Keep scrolling to find out all the information on this venue including pricing and package options. You can’t get much closer to the beach than this! The Byron Bay Surf Club is situated right on Main Beach in the heart of Byron Bay. The event space which is completely separate and private from the club has recently just been refurbished, providing the ultimate spot for wedding celebrations. Host your ceremony and enjoy canapés upon the venue's spacious deck with mesmerising ocean views. As the evening progresses, take use of the ample space inside for a formal sit-down dinner and an evening of dancing. The Byron Bay Surf Club ticks a lot of boxes on the things to consider when booking a venue; convenient location, ocean views, on-site catering facilities, BYO alcohol, a late curfew and wet-weather friendly… just to name a few. 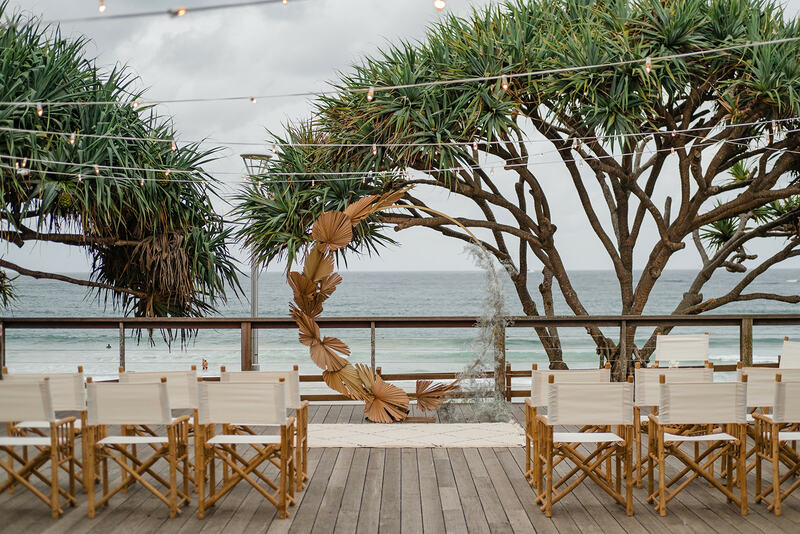 This is one of the only beachfront venues in Byron Bay that hosts weddings with dates available all year round. Featuring large open plan spaces, the Surf Club's private event space can easily be styled to give you the look and feel you desire. The Byron Bay Surf Club is situated right in the heart of town with ample accommodation options close by. Month out coordination or full planning services available. Furniture and décor to be hired through The Wedding Shed. There’s beautiful options for your ceremony, cocktails and reception. Ceremony on the deck with the ocean as your backdrop, a clear marquee can be used on the deck in case of wet weather. Cocktail Hour on the spacious deck. There's so many ways you can style the deck to suit the theme and vibe you are trying to create. Dining inside the private event space that features stunning views of the ocean. Let’s start by having a look at the run of your day. This ensures that every detail is timed to perfection. We suggest bringing everything forward an hour or two in the cooler months (April to September) to make the most of the daylight & sunset times. For most people it's a big expense to get married. We like to be really upfront with our pricing to ensure you don't receive any surprises along the way. Please use our online quoting tool to give you an estimate on what your wedding day will cost at the Byron Bay Surf Club. You can adjust the columns based on your guest numbers to give you an accurate quote. We'd love to show just show amazing The Byron Bay Surf Club is in person. Sometimes photos just don't do it justice. Please get in touch if you have any questions about pricing, what is included or would like to arrange a time to come see the venue. We know how overwhelming it is to plan a wedding. There’s so many elements that need to be decided on such as hire items, lighting, menus, floor plans, seating charts, on the day supplier schedule, supplier choices, transport, and styling just to name a few! That’s where we come in; to help ease the pressure, give you advice and look after all the logistics so you can enjoy your wedding journey in its entirety. We have a range of different wedding planning packages dependant on your needs and budget. Once planned, one of our incredible wedding day coordinators will be there to run your day exactly as planned so it's executed flawlessly and to ease any stress on the day. Month Out Coordination - This package is designed for couples who wish to do most of the wedding planning themselves but want to ensure everything runs as planned and there's no issues on the day. Signature Planning Package - This option is designed for couples who would still like control over their wedding planning but would love assistance to look after all the finer details and logistics that can become overwhelming. Full Planning Package - This option is perfect for those who purely want to be presented with information, answer ‘yes’ or ‘no’ to one person and then pay the invoice at each stage of completion. This is a great option if you are super busy and can’t commit much time to your planning, or perhaps based overseas and want the ease of having one point of contact. One of the most important elements of your wedding day will be the opportunity to enjoy exceptional food with your nearest and dearest in a beautiful setting. We work with two of the region’s award winning caterers – Fig Tree Restaurant and Feast Events. They have catered over 1000 weddings in their time and their food and service is incredible! Each wedding couple is invited to the Fig Tree Restaurant for a complimentary tasting dinner before their wedding day. This allows them to sample the food and service they will provide at the Surf Club before the big day. FIG TREE MENU - Enjoy a lavish banquet of tasting menu at your reception. FEAST EVENTS MENU - the festive option. Think themed food bars, cocktails and canapés. The Surf Club is a BYO venue. How good is that?! All alcohol and drinks can be delivered direct to the Surf Club for the team to put on ice. All wait staff are professionally trained and certified. We charge an $8pp bar charge (included in your quote), which will cover complete bar set up and cocktail making. We have searched the region far and wide to find the best of the best wedding suppliers that we love working with and who offer a very high standard of product and service. These service providers are the best of the best and will ensure your day turns out as everything you had envisaged and more! We encourage you to use these suppliers as your go to for all your wedding needs. Chat with your planner if you need help with who out of these suppliers might be the best fit for what you are after. We exclusively use The Wedding Shed for any additional items you may wish to hire to style your wedding. They offer a huge range of the latest trending furniture and décor making it easy to source quality items to bring your ceremony, dining or cocktail hour to life. We suggest browsing their website and send a wish list through to your planner, or choose from one of the looks they have already created that work really well at this venue. For those creative and style driven couples, who see their wedding day as the perfect opportunity to make a statement, and possibly throw a wedding extravaganza of something new and never done before, then you have the option to add on a Styling Package. The Wedding Shed’s Styling Package provides you with full design and styling services, offering guidance throughout the planning of your wedding. • Up to 3 personal styling consultations. • Concept development: mood boards, colour palettes and storyboards will be created so they we can nail the look and feel of your day. • Styling brief: through consultation with you (and online tools such as Pinterest) they will create a breakdown of all styled elements to be implemented at both your ceremony and reception. • Decorative-related vendor coordinating and liaising in order to meet design brief. This includes florists, lighting, prop hire etc. • Planning decorative details and installations, sourcing required materials and arranging separate quotes for their creation. • Prop/furniture floor-plans, seating plans and venue layouts. • On-the-day decorative styling and liaising with Byron Bay Weddings staff as well as coordination of florists and lighting. Have questions or would like to arrange a time to see the venue? Please get in touch.